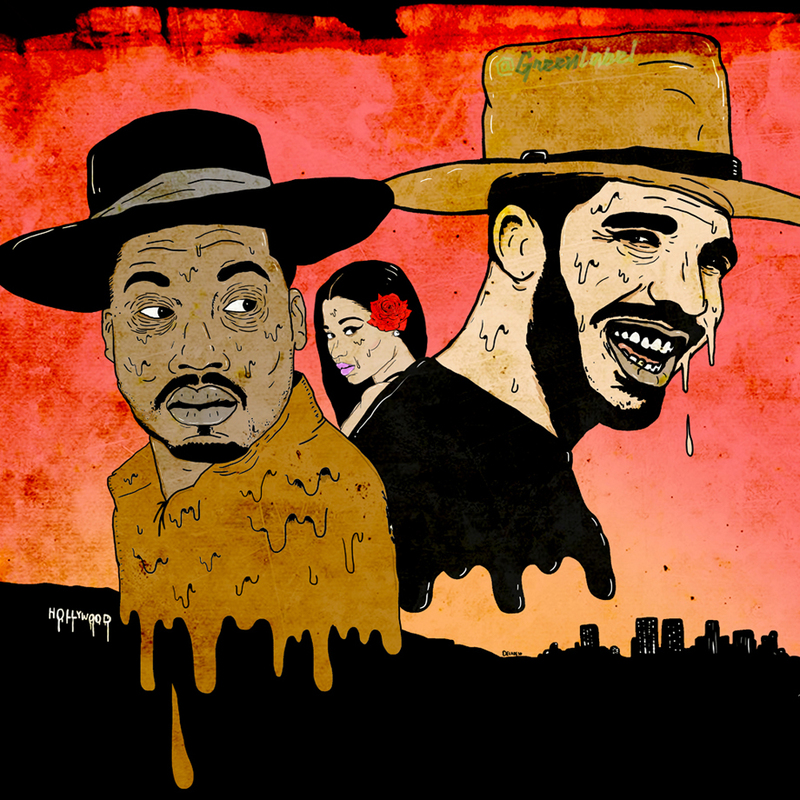 The online rap landscape is a lot like the lawless desert in old western films: It’s vast and often more deceitful than a mirage brought on by terrible thirst. The metaphysical space of the internet, combined with the dog-eat-dog ethics of the industry, do a fascinating job of throwing artists out into the wild, while also coiling them inward. The Lone Ranger archetype was the Wild West’s strongest survivor, and now it’s playing out like a prophecy in hip-hop. Rap is very much a lonely art, no matter how many good people you have around. I’d say no LP from this year’s canon feels as remote as Future’s DS2. The album’s only guest is Drake, on “Where Ya At,” a song that’s as much about unwavering loyalty as it is a brooder’s inability to trust. Not to mention Future also dresses the part. “Where Ya At” makes sense under the lens of the Old West—that a song about steadfast loyalty would arrive just around the time Meek Mill started popping off with those ghostwriting claims. What started with Meek’s Twitter fingers ended with Drake annihilating him with a rapid series of diss tracks, a modern-day quickdraw from which only one could walk away. If the whole thing was really over music though, you’d think, like Future, Meek would have understood the value of having Drake on a mid-summer anthem like “R.I.C.O.” Instead, he took offense to the internet’s comparing him to the 6 God and, in essence, tried to make its comparisons look silly via this big reveal. But as with an outlaw blindly taking on the vast and sweltering desert instead of embracing it, the harsh internet landscape always wins. The ability to put out music independent of a label have broadened hip-hop’s horizons while also acting as quicksand in which trying-to-get-discovered artists can be easily swallowed and no one notices. The cycle repeats itself, as there’s always someone else waiting for their shot at fame. It creates a smothering amount of content for the hip-hop fan to sort through. To this effect, hip-hop proves to be as disorienting and intimidating an environment for the listener as for the artist. The anxiety of feeling like you’re always missing out on music is painful. We fans also contribute to the unruliness of hip-hop by favoring seemingly contradictory values. It’s like when people call Kendrick the voice of our generation and expect him to push hip-hop’s frontier forward, only to find themselves upset that To Pimp A Butterfly was noisy and complex. Spencer Kornhaber, in his review of the album in The Atlantic, actually evoked some similar imagery: He described Kendrick’s voice as sounding “shredded like that of a man dying in the desert.” TPAB often sounds like the main attraction from one of Buffalo Bill’s Wild West circus shows. But instead of it being 1883, it’s 2015, and although one might say Kendrick is more concerned with the ruthlessness of modern America than that of hip-hop, what has pushed this country’s frontier forward more than rap music? All of these rappers know the importance of being self-serving in today’s climate; you can’t just ride waves, but you have to protect your own. It’s really no different than the old stories told from the desert, stories where if you ain’t got what it takes, it’s just a matter of time before you get swallowed up and never heard from again.